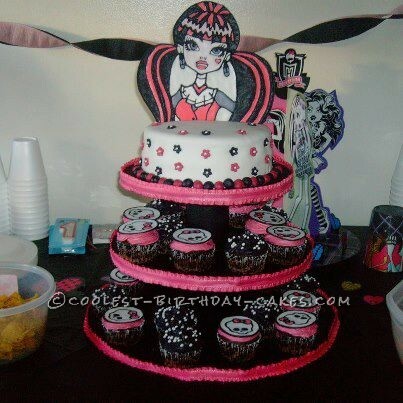 The Monster high cake I made for a special friend’s 10th birthday. She loves Draculaura. The cake is red velvet covered in marshmallow fondant. Draculaura is made form flood icing – my fav new cake media I think EVERYONE should try! The cupcakes are iced with cream cheese frosting and topped with flood icing skullets. One of the most fun cakes I have done yet!! How can I buy the topper?